We want to ensure that you are happy with the ordering process as well as the final product. So if you have any questions, or see something you like but want a different color, don't hesitate to contact us. All of our flat pieces are printed 120 lb. Mohawk Superfine Eggshell. Folded cards are printed on 130 lb. Mohawk Options Recycled. Ordering is easy. 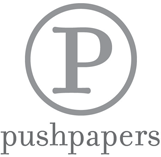 Once you place your order, email your requested text to natasha@pushpapers.com. Your text does not have to follow the format of the invite or announcement. For instance, you may want to include hosts on a shower invitation, or give your guests specific instructions. We can only use photographs with the permission of photographers, etc. So by sending a photo, you are ensuring that you have permission to reproduce the photo. So check with your photographer first! Again, don't hesitate to contact us with questions.We look forward to working with you!